I have had this toboggan around for a long time. It spent a lot of time outside so the wood turned an ash grey. I disassembled it a few months ago so I could cut the rotten parts and sand the curve. I thought about making coat racks out of the sled slats or maybe even a floating shelving system.In the end I really wanted to make it a table. 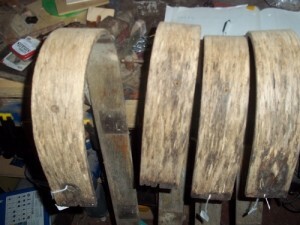 There were originally 7 sled planks, but one of them is badly cracked. I may be able to fill the crack with wood putty and paint it all crazy and add hooks and get a coat rack too. Pegs would be easy to install , but getting some nice ornate brass hooks would be cool, or copper but back to the table. I was going to use a ladder for the legs and just nail the toboggan directly to a ladder rung. Unfortunately I didn’t have enough ladder parts to make matching legs so rather than try to force it, I put the toboggan pieces aside and worked on other things. I have been trying to design a leg system for the toboggan ever since. I want legs that are structurally sound but also unique. I want it to be both modern and rustic. 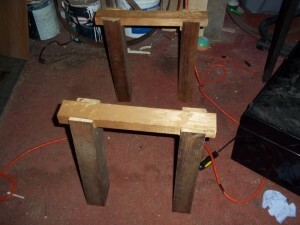 I built two leg supports today that might work. 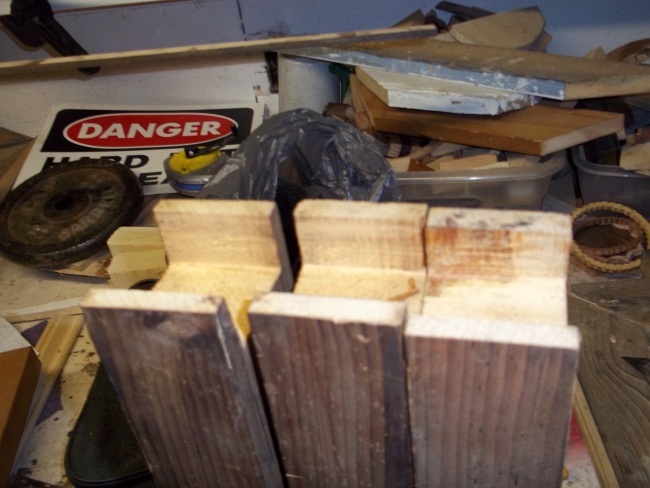 I cut 4 pieces of cedar to 15″ tall and then I cut matching notches into the cedar.The notch was 2″ wide and I hammered in two more pieces of cedar to make a sawhorse-like table leg. 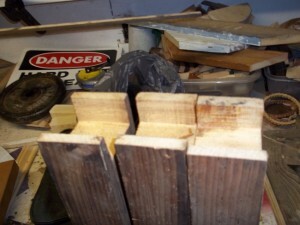 I will strengthen the joint with a dowel or something before I finish it. Once i had the legs I experimented with different ways to arrange the toboggan pieces. Should the curve turn up as it would if you were racing down a hill? Or should it sit upside down? I arranged them in all sorts of ways and so far this is the version i like the best right now. 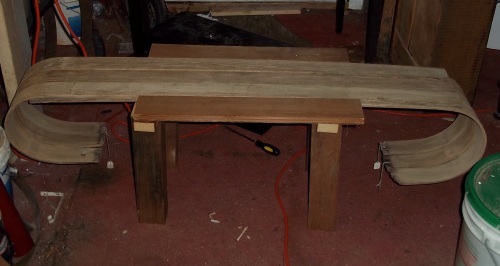 I have two pieces of cedar flooring flanking the 6 toboggan planks. There are 3 on each side which provides a cool visual element. I am not sure if this is the final incarnation of this table, but I like where it is going. The question is, if I leave it like this do I stack the slats like I have them in the picture or do I cut them so there is only one layer of toboggan? I think I will leave it as it is overnight and decide in the morning. Update June 6 2013: I still haven’t decided how to construct this table. It would be kind of neat to make it modular. I could attach the toboggan pieces with metal or leather and make it moveable. Kyle suggested I turn it into a plant stand. 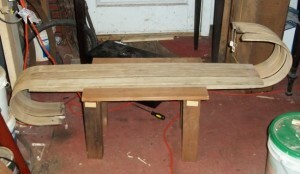 I am going to construct smaller legs on Friday, June 7 and try assembling it without the cedar planks flanking the edges. I played with it some more tonight and set up differently. I am not sure which version I like better. One last update: Next time I will just write a new post. I took a picture of the table with the curves facing down. I like it but I think the original curve-side-up look is what I am going to go with. 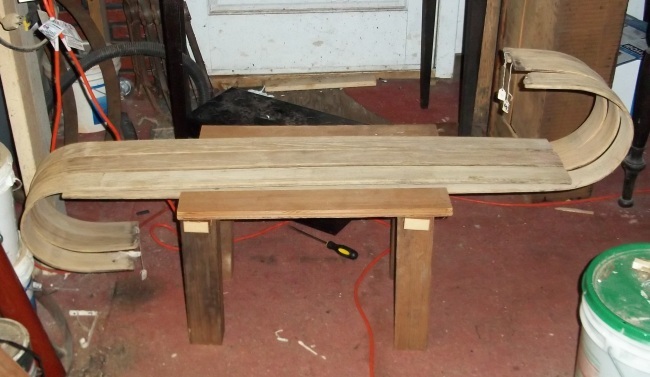 I would be really cool to make a belt and put in wooden belt loops and drill holes and use dowels to secure the table so it could be arranged any which way, but I have lots of other projects to work on so maybe the next time I get a toboggan I will try that. 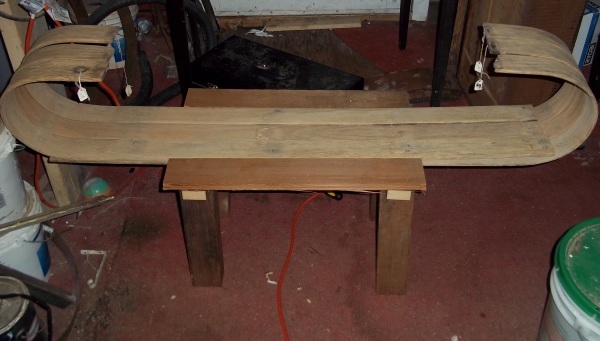 This entry was posted in scrap wood, tables for sale, toboggan, wood working by brighid. Bookmark the permalink. Will the woods be treated – with stain or finish? What are the actual dimensions? I may paint it all black or not. I am not sure yet. I will put a layer of lacquer on it when I am done. 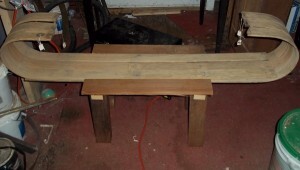 The table is 47″ long in the middle, and the edge cedar is 22″ long on each side. It stands 16″ tall and is 14 1/2″ wide. This is just such an interesting idea. Since you are playing with the form have you any photos with both sides curving under?